There is a multitude of 12-step groups for various issues, including (but not limited to) Alcoholics Anonymous (AA), Narcotics Anonymous (NA), Overeaters Anonymous (OA), and Gamblers Anonymous (GA). While they may display slight variations in name, all programs have the same basic foundation and components based on the 12 steps listed below. The steps move from a sense of powerlessness and loneliness to empowerment and community. The steps below mention alcohol and alcoholics since the first 12-step group to emerge in the 1930s focused on alcoholism solely. Yet different groups have adapted the language slightly to more accurately reflect their common affliction. 3. Made a decision to turn our will and our lives over the care of God as we understood Him. 4. Made a searching, fearless moral inventory of ourselves. 8. Made a list of all persons we had harmed, and become willing to make amends to them all. If you are wondering if a 12-step program is for you, please note that it is not wise or possible to work all 12 steps at once. After all, Rome was not built in a day! Most 12-step members go through the steps under the guidance of a sponsor, who has already worked the steps and has established a recovery-oriented lifestyle. While there is no one way to sponsor or be sponsored, most include in-person study of the “Big Book,” Basic Text, or other 12-step literature with phone calls to help cope with day-to-day struggles. There are no fees or dues for-12 step membership or sponsorship—this is not a gym, church, or pyramid scheme. Perhaps the part of the program which espouses the most trepidation for newcomers is the spiritual language regarding “God” and a “Higher Power.” Keep in mind that it is more important to accept that we are not God rather than defining what God is. 12-step groups are host to a variety of spiritual and religious traditions. 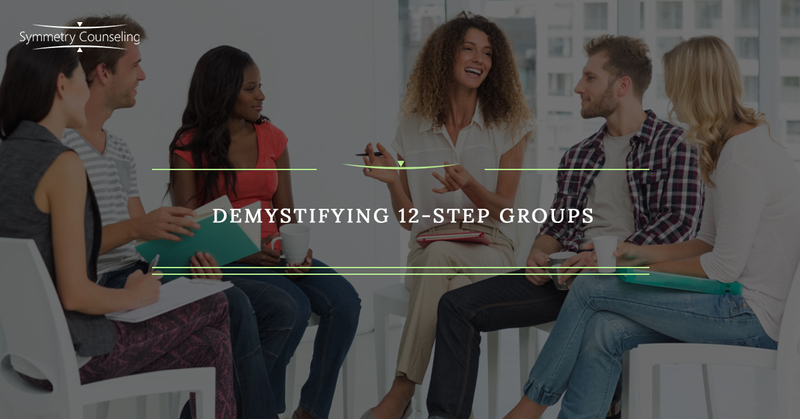 Many members use the group itself as a Higher Power and experience the so-called “spiritual awakening” in step 12 gradually over time. All that is required at the beginning for an effective start is open-mindedness. Perhaps one of the most important and beneficial facets of 12 Step membership is broadly known as “the fellowship” and refers to community and friendship amongst members. Any attempt at recovery that does not include changing (at least to some degree) the people, places, and things that are associated with the affliction will likely be futile. If you are wondering if you could benefit from a 12-step program, consider setting up an appointment online or over the phone (312/578-9990) with one of our therapists at Symmetry Counseling. We look forward to walking this journey with you!